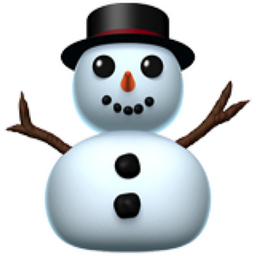 He has Coal for eyes and Twigs for arms but you can still call him Mr. Snowman. Emoji History The emoji code/ image log of changes. This emoji was part of the proprietary / non-standardized emoji set first introduced by Japanese carriers like Softbank. These emojis became part of the Apple iPhone starting in iOS 2.2 as an unlockable feature on handsets sold in English speaking countries. In iOS 5 / OSX 10.7, the underlying code that the Apple OS generates for this emoji was changed.